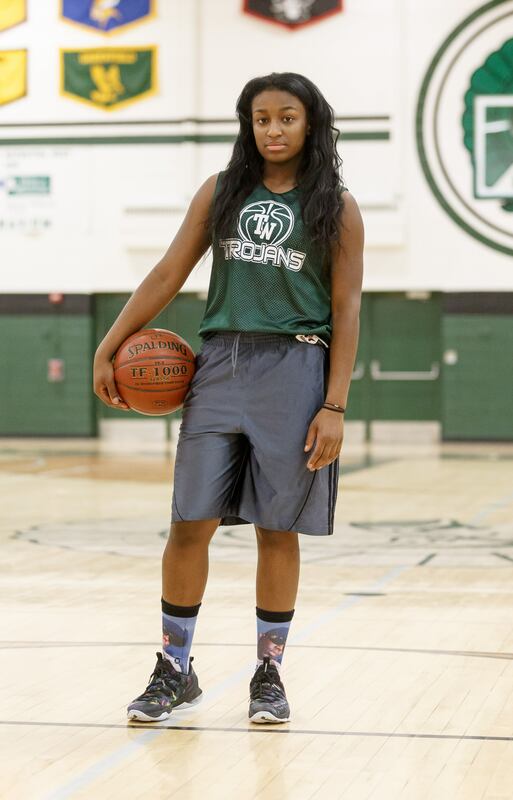 Senior Dasia Davis, a key player on this season's Wauwatosa West girls basketball team, first discovered the game down in Mississippi. Davis has helped first-year coach Gordon Nikolic change the culture at West, already surpassing last year's victory total (4-20) with a 5-10 overall record. The Trojans are already within one win of tying last year's Woodland West total (3-13) with a 2-7 record in conference play. Davis, a transfer from Whitefish Bay Dominican, currently leads Tosa West in points (10.4 per game), rebounds (8.5), assists (2.5), steals (2.2), blocks (1.4), field goals, field goal attempts, free throws and free throw attempts. "I saw my cousin Portia play in Mississippi," said Davis, who was in first grade at the time. "She was one of the best players on one of the best teams. She had courts by her house and we started shooting around. I enjoyed the thrill, the rush playing the game." Not long after her brothers started playing basketball for middle school. Her dad was a coach and she started sitting in and watching their practices even though she was the smallest ones back then. "They were in seventh grade and I was in first," Dasia said. "They were blocking my shots, but that's when I realized I wanted to be a basketball player. It's physical and I just like contact. I like to drive to the basket. Half of my shots were drives." She first became interested in the school because of her cousin, Ania, who is is on the freshman team. 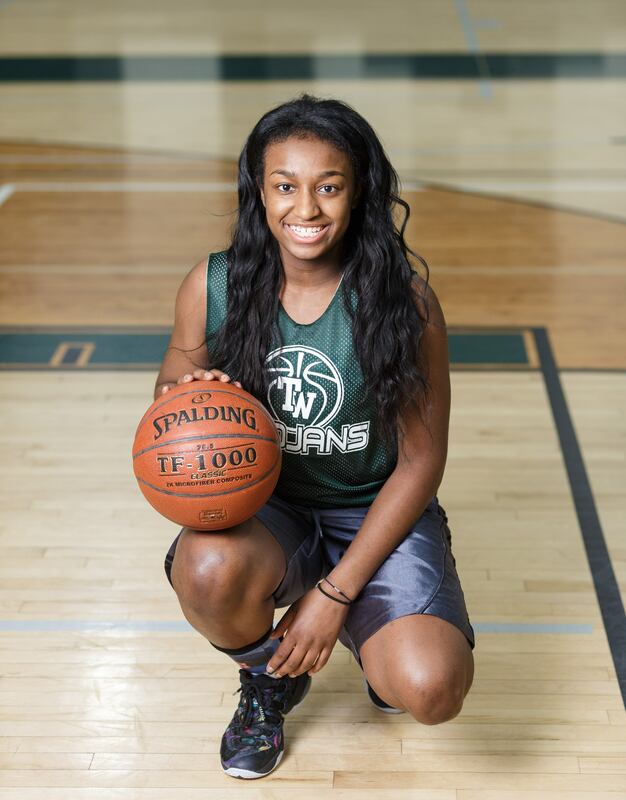 Davis has been thrilled with her move to Tosa West and helping her new teammates begin to get back to respectability. "I wanted to get them past four wins, help improve the program here," she said. "When people heard I was going to transfer here, they kind of talked down about the program. I told them you can't look at previous years and now we look to put Tosa on the map." Davis had nothing but good things to say about Dominican. "It is an excellent school academic-wise. It pushed me to do things that my middle school didn't. Basketball-wise the program was good. We had a solid team, but after three years I just needed a different look. "It's been wonderful here. Academically I have the things I had at Dominican, so I could easily apply them here." Davis was also accepted by the student body. "The students are very nice," she said. "I was invited to sit at different tables. The basketball team I first met at fall ball. They were welcoming and when I first met them they were full of life. At the first open gym with the rest of the girls it was just fine. There wasn't any 'This is the new girl, we have to treat her different." This will be Nikolic's fourth head coaching job, as he previously led the girls basketball programs at Cudahy and Burlington and spent one season as the boys basketball coach at Westosha Central. From 1999-2010 he coached at Cudahy, where he had the most wins in program history with 146. He led the Packers to nine straight winning seasons from 2001-2010 and won regional championships in 2008 and 2009. Nikolic first met Dasia at open gym and he did see her play for her AAU team, the Playground Elite. "She's a great kid, very coach-able to have," he said. "As a basketball player, she is a young lady who is aggressive. Right away I knew we were going to get along. "Off the court she is quiet, well-mannered and can blend in with the crowd." Being new to the Trojans, it is not often a player is called on for leadership. Dasia sees Cheri'a Adams and Libby Fassbender, the other senior captains, as all having different leadership roles. "Cheri'a is the more organized captain, Libby is the uplifting captain, I'm more the basketball athletic captain," Davis said, talking about her role on the court. "On the court leadership is very important," she said. "Being aggressive, making sure that everyone touches the ball, trying to get everybody in the game. Just making sure that everybody on the court is ready to play basketball. "Girls look at you on the court and see you as a leader and if you're on a downer, they might follow you. But I'm lucky enough to have a team that will lift me up. It rubs off on the other girls and that's what holds this team together." Davis will play basketball at Ripon College after she graduates. "It doesn't matter what grade that you started playing basketball, it just matters the time and effort that you put into it to get better," Dasia said. "A couple years ago playing college basketball wasn't even a thought. Then when I got to high school, people (including Allazia Blockton, sophomore at Marquette University) pushed me into thinking I could play college ball." Nikolic spoke about Davis' strengths and weaknesses. "She is very aggressive, drives well, is a good rebounder," he said. "She anticipates the passing lane, so she's a good passer. She's our best defender. She just knows the game of basketball. "She will be seeing more double teams, so she has to be more patient. She's a better passer now." Davis also knows what she is good at and what she needs to work on. "Driving and finishing, just being aggressive," she said about her strengths. "But I have to develop my jump shot when I get a little stronger. When I went to visit Ripon I went to realize, 'Yeah, I'm not the biggest person. They told me I'm smaller, I like to drive a lot, but I'm going to get a lot of shots blocked. So that's why I realize I have to develop my jump shot more." Davis, who is listed at 5-foot, 9 inches, is the second tallest Trojan, as two sophomores are listed at 5-10. "Since I first started playing basketball all the way until eighth grade, I was one of the biggest on the team," Dasia said. "So I always played down low. Even when I got to high school. We had a 6-5 girl and she was pretty solid. And we had a 6-3 girl and our coach told me there was a chance I might never play post in high school." ​The roster actually lists Davis as a guard-forward-center, showing her versatility, something she had to deal with at Dominican. "So for two years I played around the wing, but when one of those girls graduated I went back and played post. For AAU we had a 6-5 player and I never played down low. That drove me out to the wing." Nikolic sees his team as a work in progress, as he tries to build a winning culture and maybe eventually make the regional finals. And Dasia Davis will probably be a big part of any success the Trojans will have in the 2016-17 season. Nikolic told Davis he expected a lot of her going into her one and only season at Tosa West. "At the beginning of the year he told me "You're the one I expect to hold us together.' He expected me to drive more," Dasia said. "He said 'I want you to score too. You could score 19-20, but I want you to distribute the ball, forcing the girls to score.' Now we have more balanced scoring." FAVORITE MOVIE: Friday, Comedies & Drama. FAVORITE CLASS: Pre-Calculus & Spanish. FAVORITE PLACE YOU VISITED: Goodman, Mississippi. WHAT DO YOU DO TO RELAX? Watch TV, Listen to Music, Hang out with best friend. FAVORITE SPORTS RIVALRY/ATHLETE: Racine Prairie, Kenosha St. Joseph. MOST MEMORABLE SPORTS MOMENT: Career-high 26 points as a sophomore vs Martin Luther. WHAT WOULD YOU LIKE TO DO IN THE FUTURE? Attend Ripon College, study Criminal Justice, Social Work or Physical Therapy.